Just a confirmation that there will be no run this Saturday due to the Two Oceans activites. Saturday 7th April will be a Silvermine circuit. Deals in next weeks email. Have a super long weekend! A small group of trailers arrived in the pre-dawn light to sign up. Despite the overcast weather it was surprisingly warm as we stepped outside our cars. Two routes were decided upon: two different speed groups were going to do the contour out and back route and a medium group and the relaxed group were going to go up skeleton and down nursery. Tim and Buyiswa disappeared down the contour followed by a young couple joining us for the first time. Lorraine and her group stayed with us till the path up skeleton and then carried on as we turned left and started the climb up the mountain. I lost track of time photographing them. As soon as Debbie and I met the others at the bottom, we started off home back along the contour path. A great day out, enjoyed by all no matter which route. The relaxed group along with a newcomer, did Skeleton and Nursery in a very respectable time. 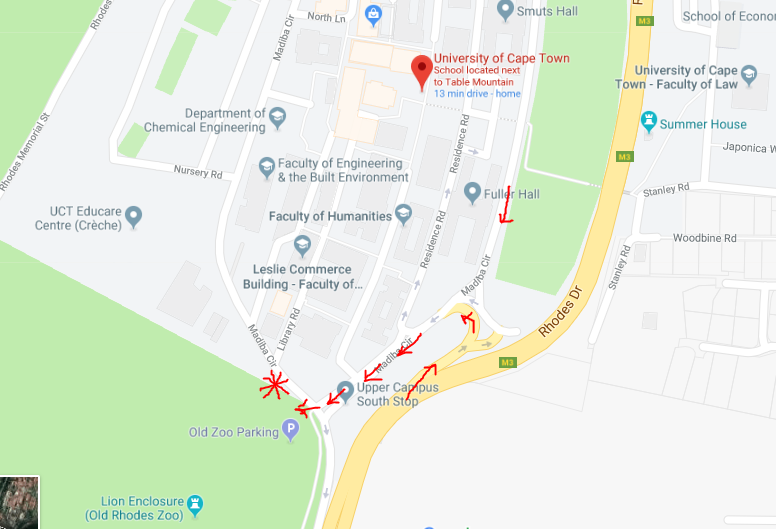 Tomorrow's run is ON but we'll be meeting at the NEWLANDS FIRE BASE - I repeat: NEWLANDS FIRE BASE - and not UCT parking. The area around UCT is very busy with the set up of the Epic and parking may be difficult. Please be there by 6.25am latest for a 6.30am start. We'll do the OMTOM 12km route but we'll start a little further in. The weather looks fresh and clear, perfect for trail running. Peter will be taking a Relaxed group though Nora and Marge are both away. Any Irish blood to be announced by the wearing of the green. Sláinte! 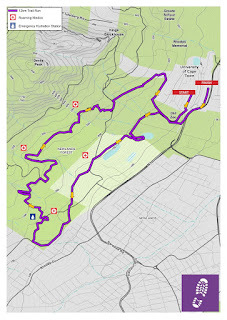 This Saturday we will be heading down to the woods to do a recce of the OMTOM short trail route. RV at the UCT car park nearest the Old Zoo (but not at the Old Zoo itself). 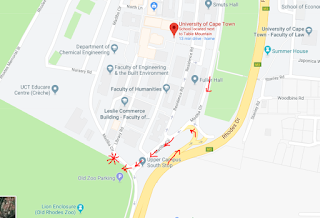 See snippet of UCT map below for directions to the car park. Sunrise is at 6:43am so we'll start at 6:30am. Bring your headlamp if you're at all worried about the light at the beginning. Please arrive a few minutes early to sign in. Starting from UCT, the route kicks off with a gentle uphill warm up, past Mount Pleasant and into Newlands Forest. Following the Newlands forest jeep tracks to the Orchards Trail, the route passes the Woodcutters ruins and enjoys kilometers of beautiful forest and streams as it meanders up to the Woodcutters track. A pleasant descent sends runners through Avatar Forest and The Old Zoo before finishing at UCT. This route is advertised as a 12km. We can easily extend it to 14km if anybody is keen. Further details about faster and slower groups to follow on Friday, but the Committee will run it in about 90 minutes. The weather looks to be warm and sunny and, if we get the promised rain mid-week, there might be some freshness to the forest floor and a trickle of water in the streams so dress accordingly. If you have any Irish blood in your veins, wear GREEN! This is a pack run. Please remember to look behind you at every turn in the route to make sure the people behind you see which way you are going. RV in the beach parking lot at the bottom of Chapman's Peak Drive in Hout Bay, outside Vida e Caffe at 6.20 ready to start at 06h30.